David Nash, GM Nutrition & Quality Equine Nutritionist BARASTOC (Ridley) Feeding the horse / pony that has propensity to gain weight easily and become overweight is always a big challenge and if not payed due attention could quickly lead to health problems such as laminitis / founder and the collective Equine Metabolic Syndrome. As we have mentioned in previous articles we always look to manage the horse individually and hence treat their diet the same way. You may have several horses on your property and they may be the same size, weight and be undergoing the same exercise regime however their weight / condition may be vastly different on the same feeding regime. This may be due to breed, (Warmbloods , western horses such as quarter horses and draught crosses seem to metabolise their energy more efficiently than other breeds such as thoroughbreds), metabolism, behavioural demeanour, environment are just a few factors. As such the energy ‘calories’ content of the horses’ diet must be controlled so a healthy condition score is maintained. Monitoring of the diet is extremely important and knowledge of what you are feeding both from the bucket and from the ground (pasture / hay) is even more so. At the time of this article being compiled we are looking at the end of summer and heading into autumn. As a result many of our horses are relying mostly of feed from us and some lower quality dry pasture. When the autumn break arrives we will get a spike in pasture production and hence the available ‘energy’ from pasture will be more abundant. If we do not control this we may see a dramatic increase in the condition of our horse or worse case for horses predisposed, laminitis can occur. Planning ahead of the breaks will assist in reducing potential complications during autumn and Spring breaks in terms of pasture availability. 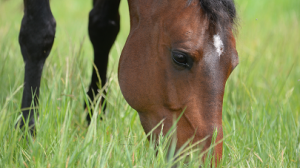 Having ‘dry lots’ which are areas with little to no pasture for horses to range on with a low ability to consume large amounts of pasture, pasture muzzles also are another option to reduce pasture feed intake as well as slow down the rate of intake which is just as important with regards to glucose metabolism and horses suffering from Equine Metabolic Syndrome (EMS). If a “dry lot” situation or grazing muzzles are not an option and alternative is to encourage horses to consume lower energy pasture / cereal hay rather than the pasture. To even further reduce the energy / sugar content of the feed soak the hay for 30 - 60 minutes, rinse the water out and feed out in a double hay net to reduce consumption rate. I have seen many people advertising “low sugar” pasture hay. If you are going to purchase this hay it is mandatory to ask for a feed test. A NSC (non-structural carbohydrate) level should be below 10 -12%. This hay should be ideally mature grass. As the pasture elongates the sugar levels will reduce. Whilst not ideal for dairy cattle this type of hay is ideal for horses requiring low calorie diets and that are at risk from metabolic disorders. A common misconception of feeding obese or fat horses is to reduce their intake of feed dramatically. Doing so can lead to many problems such as malnutrition, colic and gastric problems such as ulcers. The horse evolved as a ranging herbivore so its digestive system is designed to eat small feeds frequently. By dramatically reducing the amount of feed (volume), changes the amount of energy consumed as desired however it does not take into account for the minimum amount of feed which an animal requires for a healthy digestive systems as well as to keep a healthy gut microbial population. Another problem that arises when we dramatically cut the amount of feed we give a horse in order to maintain or reduce weight is that our nutrient ratios and amounts will change. If we simply reduce the amount of the same feed whilst not readjusting the type of feed or nutrient concentration we can lead to under supplying nutrients such as protein, minerals and vitamins which are essential for maintaining the health of the horse. When reducing the caloric intake of your horse it may be wise to consult a nutritionist or even use some of the online ration evaluators such as Microsteed to assist in rebalancing your horse’s diet. You may find that rebalancing your horses diet with a lower energy roughage source along with appropriate supplements for other nutrients such as protein, vitamins and minerals will maintain your horses condition in a healthy state but will also assist in maintaining a target condition for your horse.